Indigo is what we use to make our jeans blue and our hair black. It is also used to make browns,mahogany,copper brown and other dark colors. Learn more about indigo hair dye below and how you can use it to dye your hair. Indigofera (indigo) is a flowering plant, and is widely used for hair dye. It is a green/blue powder and smells like frozen peas. It is also what they use to make blue jeans in the old days. We use it to create a luscious deep jet black, browns,deep reds and mahogany hair color. It is easily mixed and does wonders for your hair. Cover the gray the natural way!TM With Harvest Moon Indigo. Our Indigo comes from a flower and is not man made, it comes from Mother Nature. Use it to darken up other colors or create black or purple. To create purple simply mix it with high alcohol beer instead of water. Bud ice is perfect for creating purple. Mix the indigo with warm tap water and apply immediately to clean dry hair and rinse 1 to 1 ½ hours later.Some people will achieve a permanent black by doing this. Some cases it will turn a slight purple or green at first and then it will turn black within 24 hours. Some it might turn purple or green or it might not be permanent. If this one step does not work for you, you will need to purchase the black kit. It comes with 100 grams of henna and 100 grams of indigo. Indigo is a green powder that many confuse for henna. 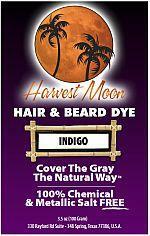 Harvest Moon indigo is mainly for the hair, it will only stain hair, hands and some parts of the feet green then turns blue to black within 24 hours. Some people say it smells like frozen peas. Indigo has been used in India, Arabia, Egypt,China, Yemen, Oman and Iran for hundreds of years.